Across our country educational policies and practices are killing our students' desire to learn and teachers' passion to teach. The central theme of this book is that high-stakes testing is having a critically deleterious effect on our students. The fallout impacts parents, teachers, schools, districts and states. Horace (Rog) Lucido uses language and supporting evidence that is clear and relatable to the reader. Rarely is the topic of teacher care and concern for students ever embedded in works on educational theory and practice, but here it is championed as the driving force for change, exposing the causes and chronicling the effects of educational malfeasance. Horace (Rog) Lucido has taught physics and mathematics for over thirty-eight years. He is the California Central Valley coordinator for the Assessment Reform Network and cofounder of Educators and Parents Against Testing Abuse. Our children’s educational life is in peril. Their natural desire to learn is being compromised by the atmosphere created by high-stakes testing. Students only go through our school system once. Students do not know what their daily schooling is supposed to be like. For the most part they just accept what they are being asked to do and begin to define what school is in terms of their personal experience of it. We are in the midst of forceful attempts to change the motives for k-12 education. Most parents and teachers are in like accord in supporting the goal of life long learning for each individual student so as to give them the tools to begin to fulfill each student’s desires, hopes and dreams. The high-stakes testing milieu is endeavoring to change that. The drive is to prepare students to compete in the ‘global market place’ by fulfilling the desires of those in the corporate world who see students as human capital whose skills and choices are to be molded to fit the world of business. To this end education is being retrofitted to a rigid assembly line structure in which one size is to fit all. Individual student and teacher creativity, flexibility and choice are deemed unscientific and therefore suspect. It is predicated on a perverted view of science and its role in learning. It assumes all students are the same and react to stimuli in the same way. It squashes academic dissent of teachers and employs high-stakes testing as the henchmen that enforce where students, teachers and schools are to go. The result of this is outcome-based education, where the ‘outcomes’ are test scores determined only by once each year high-stakes testing. 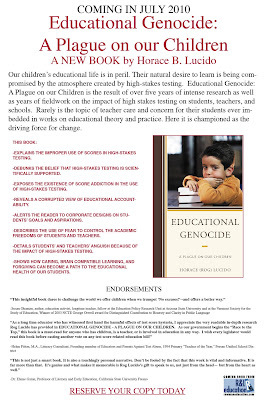 Educational Genocide-A Plague on our Children is the result of over five years of intense research as well as twenty-five years of fieldwork on the impacts of high stakes testing on students, teachers, and schools. 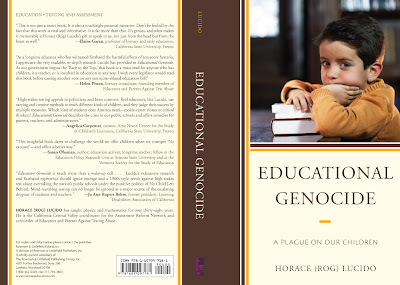 Educational genocide aptly describes what is currently happening to many of our students. This silent atrocity is taking place under our watch. Across our country educational policies and practices are killing our students’ desire to learn and teachers’ passion to teach. The central theme of this book is that high-stakes testing is having a critically deleterious effect on our students. The fallout impacts parents, teachers, schools, districts and states. It uses language and supportive evidence that is clear and relatable to the reader. Rarely is the topic of teacher care and concern for their students ever imbedded in works on educational theory and practice. Here it is championed as the driving force for change, exposing the causes of what I consider educational malfeasance, chronicles the effects, and also goes further to describe one possible solution: Forgiving Learning. "This insightful book dares to challenge the world we offer children when we trumpet“ No excuses!”--and offers a better way." "High stakes testing appeals to politicians and bean counters. Real educators, like Rog Lucido, use varying and creative methods to reach different kinds of children, and they judge their success by multiple measures. Which kind of students does America need--cookie cutter clones or critical thinkers? Educational Genocide describes the crisis in our public schools and offers remedies for parents, teachers, and administrators. " 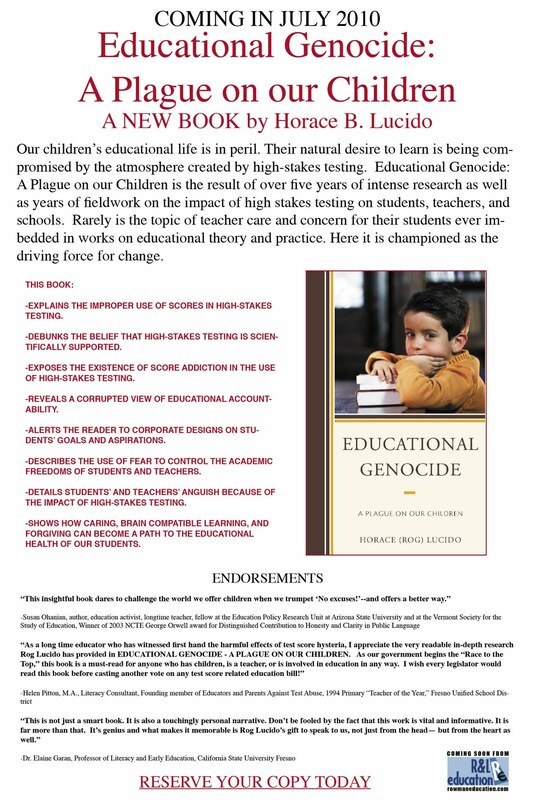 "As a long time educator who has witnessed first hand the harmful effects of test score hysteria, I appreciate the very readable in-depth research Rog Lucido has provided in EDUCATIONAL GENOCIDE - A PLAGUE ON OUR CHILDREN. As our government begins the "Race to the Top," this book is a must-read for anyone who has children, is a teacher, or is involved in education in any way. I wish every legislator would read this book before casting another vote on any test score related education bill! " "This is not just a smart book. It is also a touchingly personal narrative. Don’t be fooled by the fact that this work is vital and informative. It is far more than that. It’s genius and what makes it memorable is Rog Lucido’s gift to speak to us, not just from the head— but from the heart as well. "